The popularity of open water swimming has hugely increased since 2008 when the discipline made its debut in the Olympics with Team GB taking 3 medals. Ensuring that our swimmers have the opportunity to experience open water swimming, City of Derby SC in conjunction with Derbyshire ASA have offered training and taster sessions at the Lavender Patch in Hilton over the last few years. These sessions start in May and continue through June to help swimmers acclimatise to the water ready for the competitive season, which runs until September. Lots of our young and not so young swimmers (parents and coaches too) have taken up the opportunity to experience open water and some have gone on to compete at county, regional and national level. 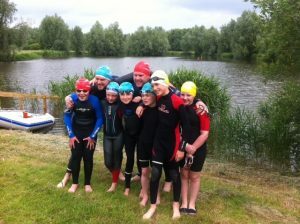 For entry and venue details for the Midlands open water championships click here.